Later today, I leave for Baltimore. 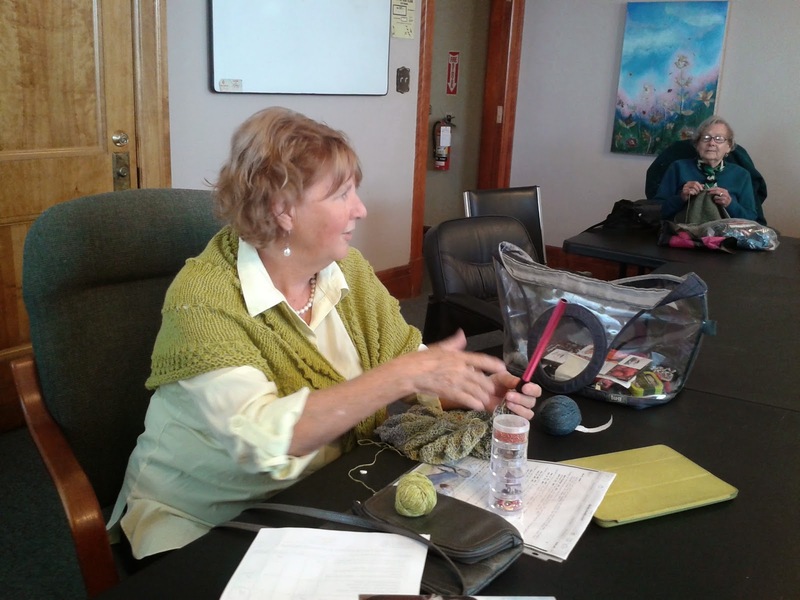 I am travelling with Lynn Gemmell of Shelridge Yarns to help her with her booth at the Maryland Sheep and Wool Festival. As I did last year. Only this year, they are having a riot down there at the moment. Far from the fairgrounds where we will be hanging out, I hope. My packing is done and more importantly, my car knitting is ready. 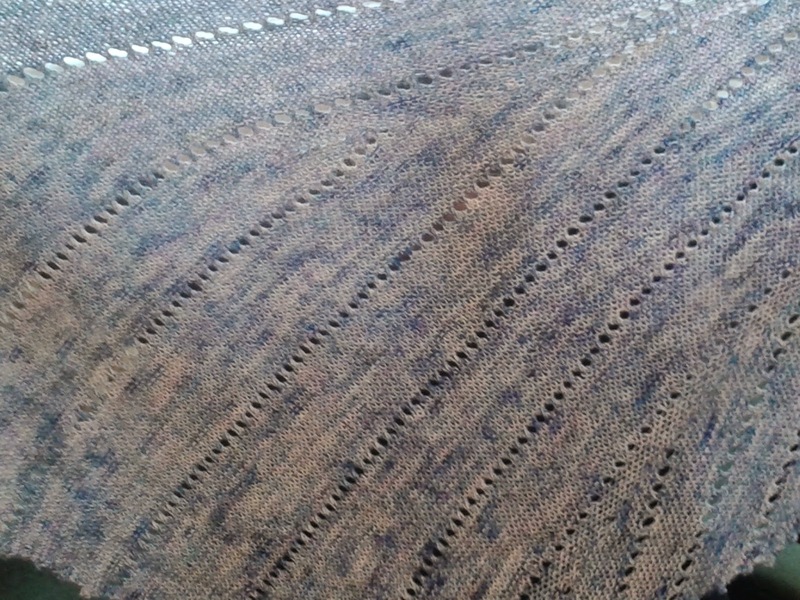 Sheer, not yet finished, is nonetheless too 'complicated' for my car knitting. Three colours on the go and a chart to read while riding in the car, would make it - for me - a nausea knit. Instead, I have dug out the yarn I purchased last year at Maryland. Being 80% cotton, 20% wool, I plan to make a spring cardigan inspired by Chic Knits Sitcom Chic Cardi. 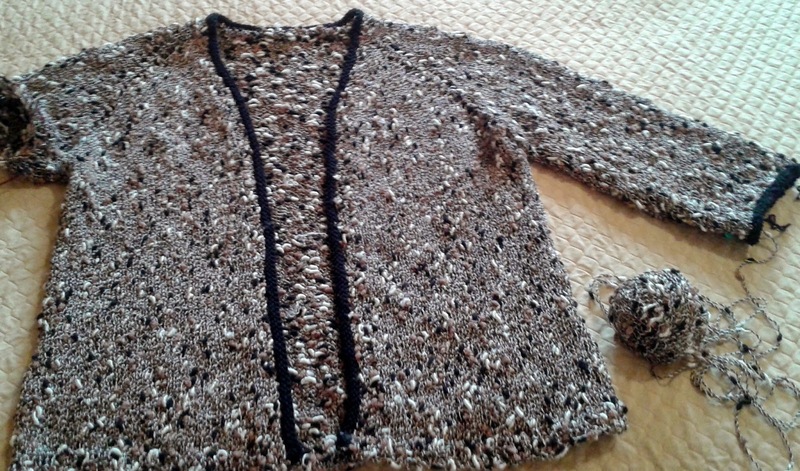 Top down, but on my sweater, the eyelet detail will be done in the pink and off-white. 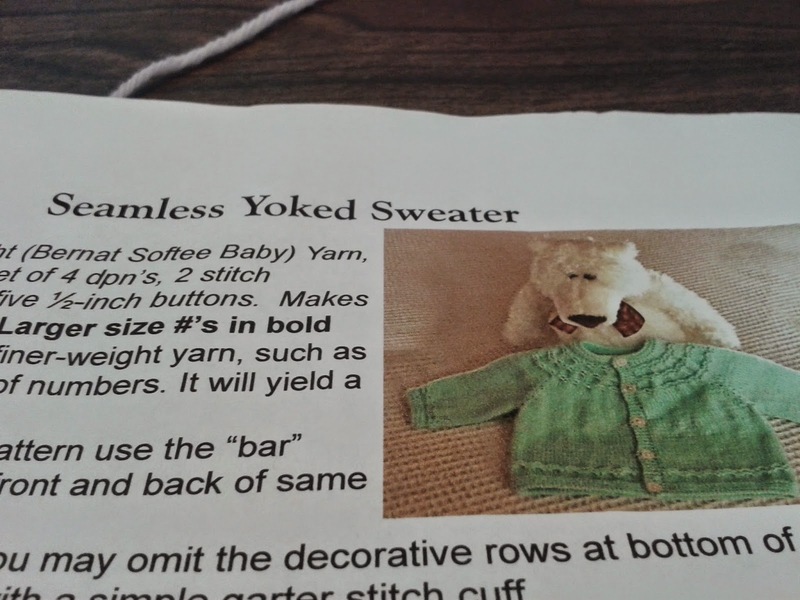 It will be a pattern-free knit - with Barbara Walker's guidance. I will cast on about 50 stitches, work a few rows of increases at the raglan lines, put in the eyelet trim and then just knit to fit. The beauty of top down. With green, pink and cream, it should look very spring-like and be a great addition to my seasonal transitioning wardrobe. Blogging will resume post- Maryland. While no wool was viewed or purchased during my weekend - unlike my knitting friends who spent time and money at the DC Knitters Frolic - we had a great time here in Thornbury at Jazzmania. Events took place from Friday to Sunday, but we had tickets only to the Saturday afternoon show. 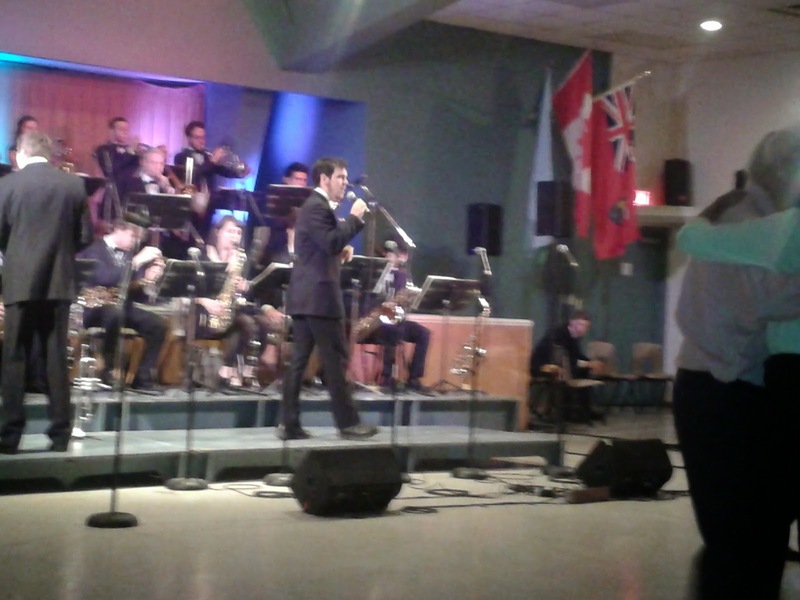 The Toronto All Star Big Band. The kids in the hall, so to speak. In the past, seating was on a first-come, first-served basis, so I convinced my group that we needed to arrive early. Only after walking through the doors, did we look at our tickets to see that this year there was seating was assigned. Oops. We were a bit early. But it wasn't long before the both the band and guests arrived and music filled the hall. One of the things I like best about this show is that the women are dressed up. Skirts, dresses, flowing palazzo pants. And lots of those special ladies' shoes that say "I dance." Heels of a 'just-so' height and thickness to ensure no toppling. Straps across the instep to prevent removal during those twirling jitterbugs. And dance they did. We counted several couples that did not sit down for entire 45 minute sets. The band is wonderful. Young. Well dressed. And in love with music. 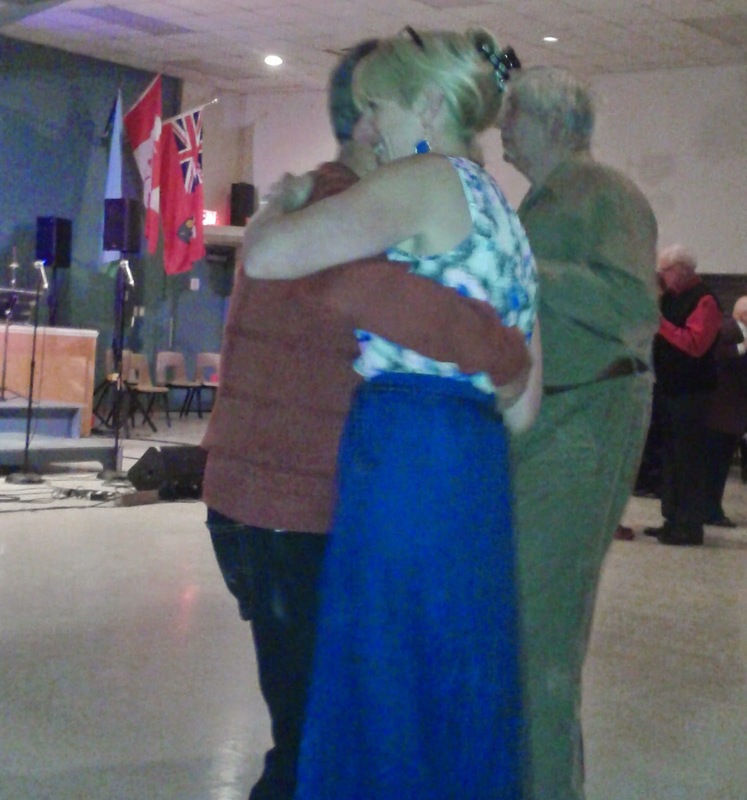 Even sis and her hubby took to the dance floor. No new wool, but still, a great weekend here. Last weekend was a 'wash' as far as my knitting was concerned. No Problem. I had nothing on all week and expected to get in lots of knitting time. Or so I thought. Then I received one of those great phone calls. Our Hearst friends who hosted us for two weeks in Florida this winter called to say they were driving home from the sunny south. If we were going to be home they would stop and stay a couple of days. Yippee! I would drop anything - even knitting - for a few days with friends. as you knew - and the front started. I am almost at the point where the third colour will be joined. Will it progress THIS weekend? Not likely. The last weekend in April is always the Jazzmania Weekend in Thornbury. 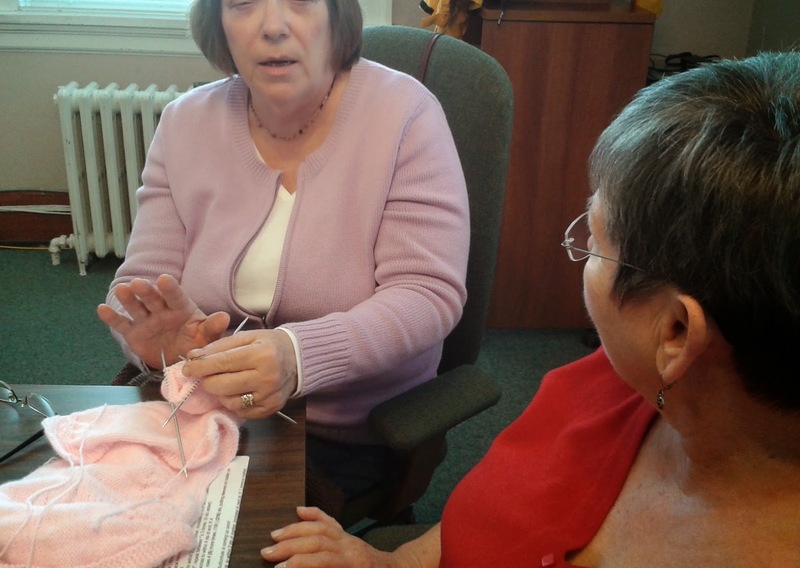 A conflict with the DC Knitters Frolic in Toronto. Why can't the event coordinators separate these events? 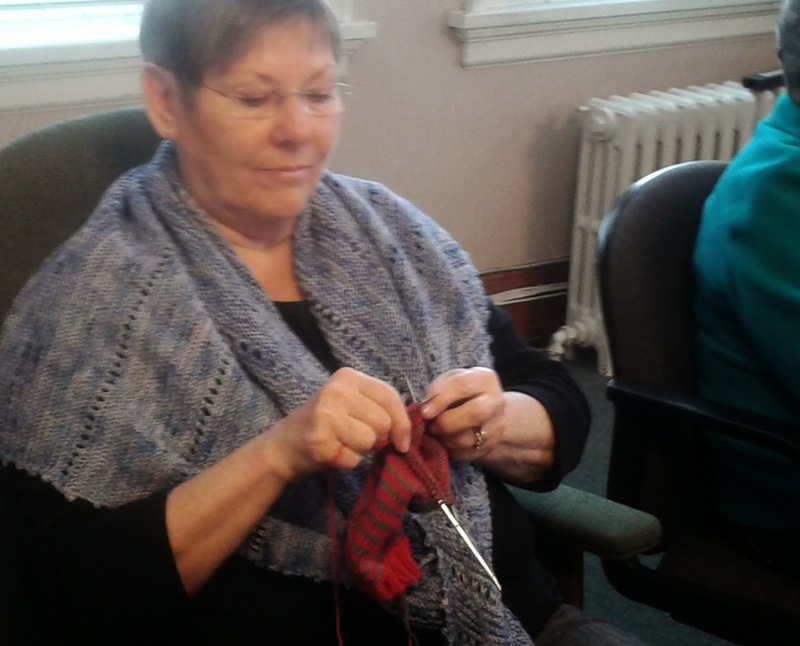 Perhaps there aren't too many knitters who enjoy Jazz. A battle of interests for me for sure. This year, the music won. 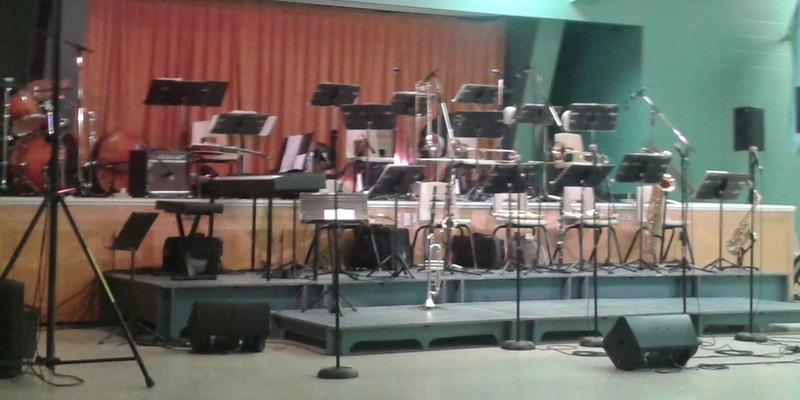 Sis and her hubby are coming up and we will see the Toronto All Star Big Band on Saturday. See them here or here . A great orchestra of young people, some as young as 15 but none older than 22. At that age they must leave the band. 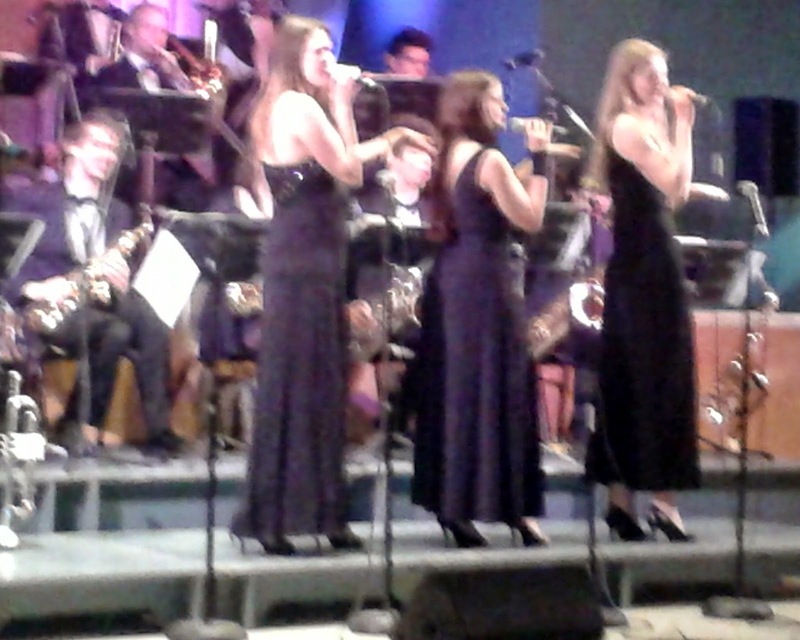 It is unbelievable how well these young folks play. 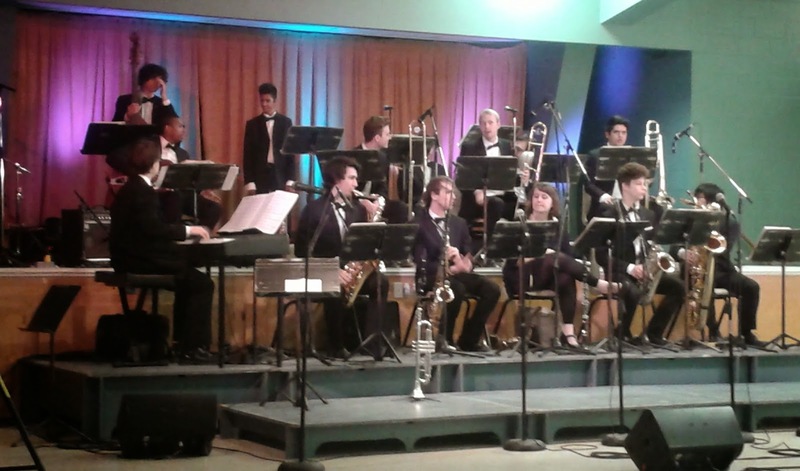 All big band, dance music of a previous era. I look at them and think how many hours it must have taken Mom and Dad to help their kids achieve this level of excellence. Driving them to lessons and urging them to practise. Dedicated parents for sure. All of this socializing though means that Sheer will probably end the weekend where it started. Here. Whether 'Frolicing', listening to music or otherwise enjoying yourself, happy weekend everyone. Back to winter weather today - cool cold and windy. I didn't get the memo. 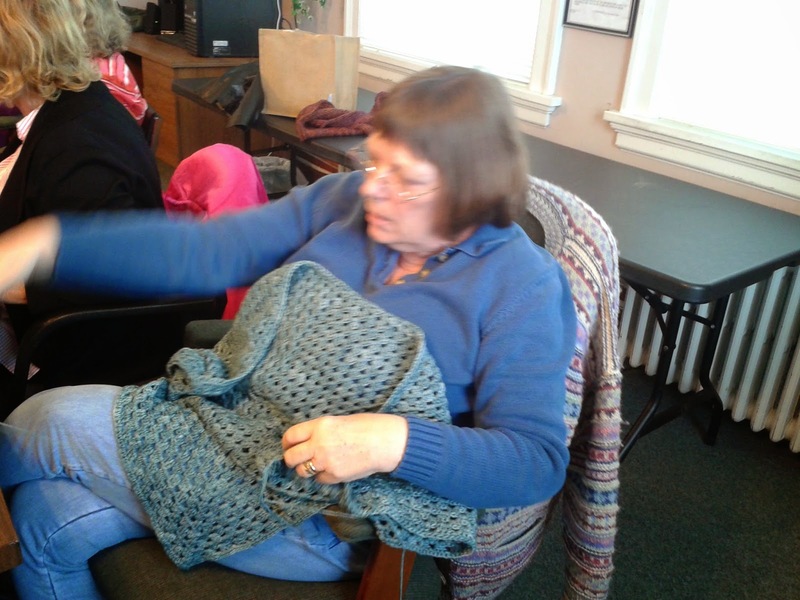 But most of the other knitters did and arrived wearing wool. 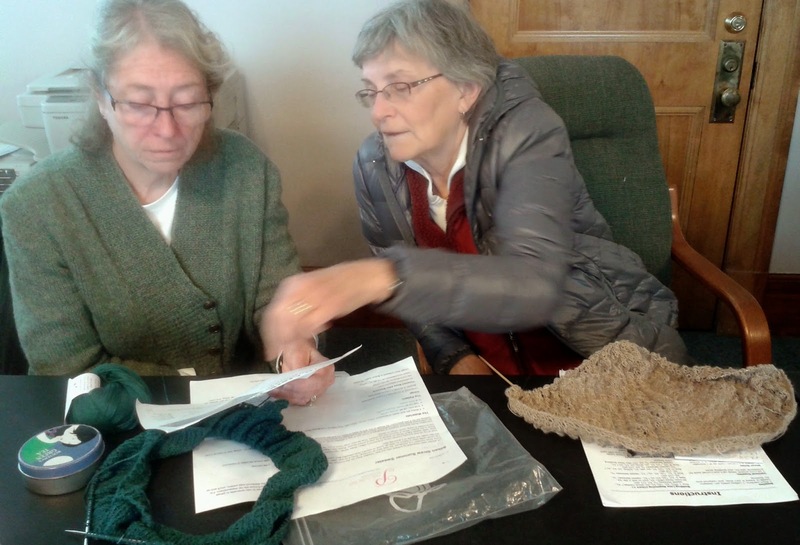 They were knitting for summer while dressed for winter. 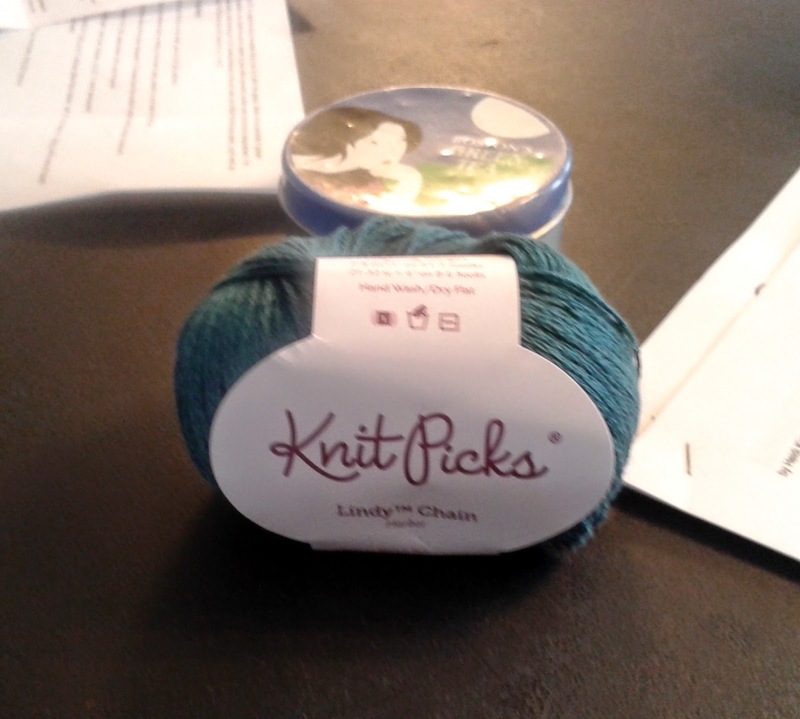 and was knitting Silken Straw with Knit Picks Lindy in this great colour. Doreen arrived wearing such a bright colourful cowl. Right away, I recognized it as being arm knitting. 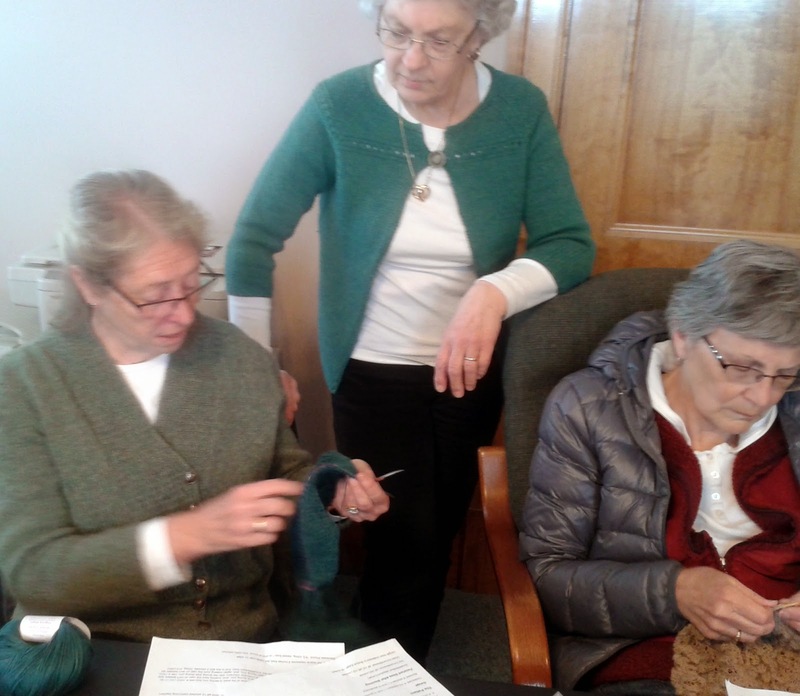 Last weekend, Doreen's Church held their annual quilt show and asked her to sit and demo arm knitting for the show go-ers. 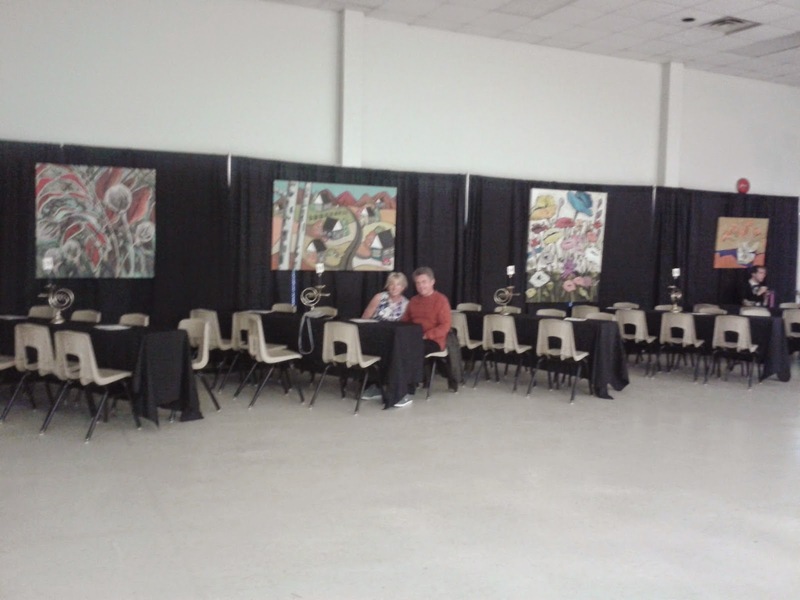 She thought she would be passed by as the attendees had come to see quilts not knitting. Instead,, she said she had a very busy afternoon demonstrating this latest knitting trend. 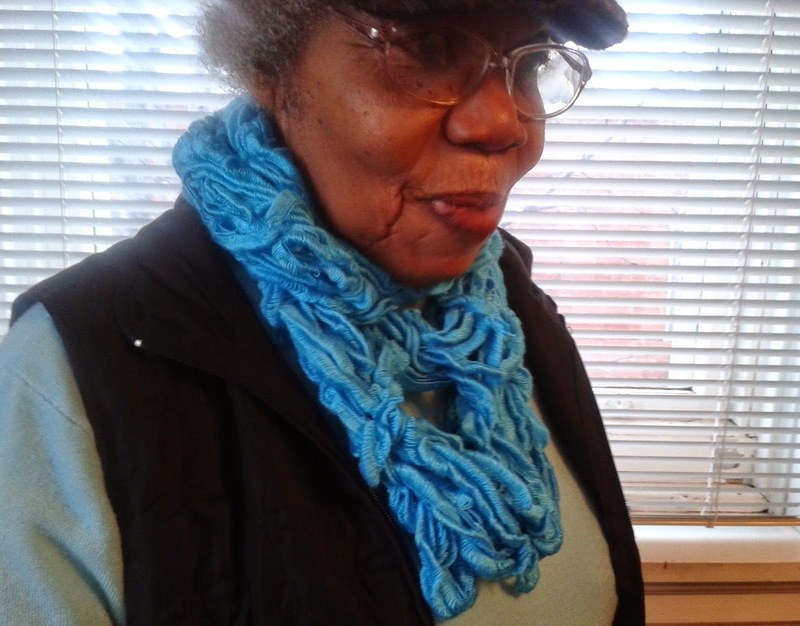 The one she is weaering was knit with the frilly yarn that was so popular for scarves a couple of years back. 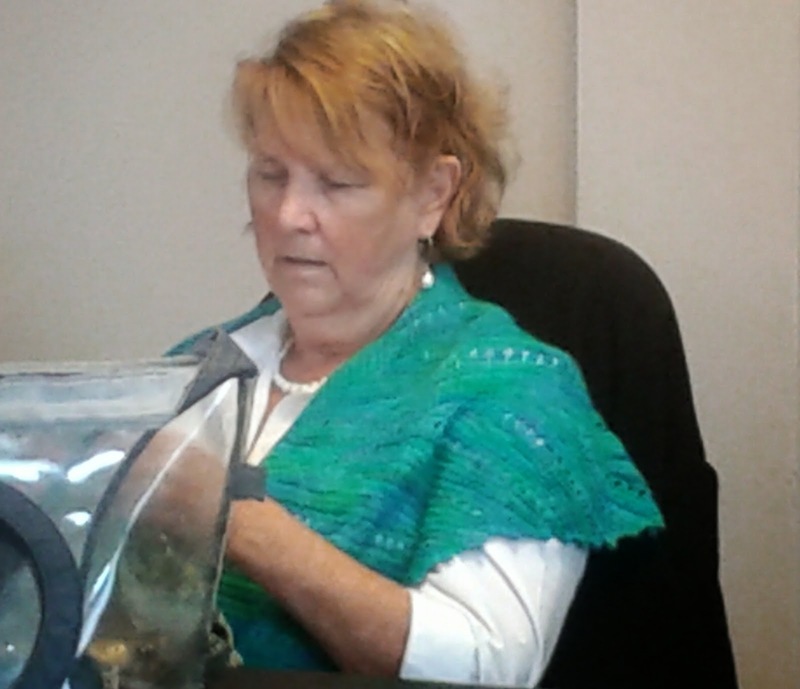 Doreen has shown us a much better use for the yarn IMO. 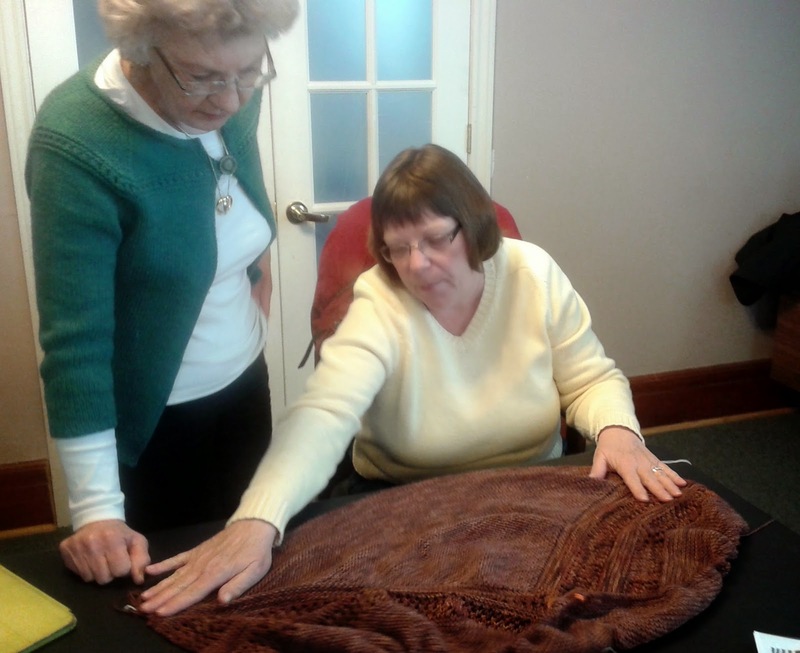 Sandy B and Sharon R kept warm today wearing shawls knit from the same pattern. Sandy wanted me to show readers how colour coordinated she is. (Although my camera did a poor job of capturing their exact sameness.) 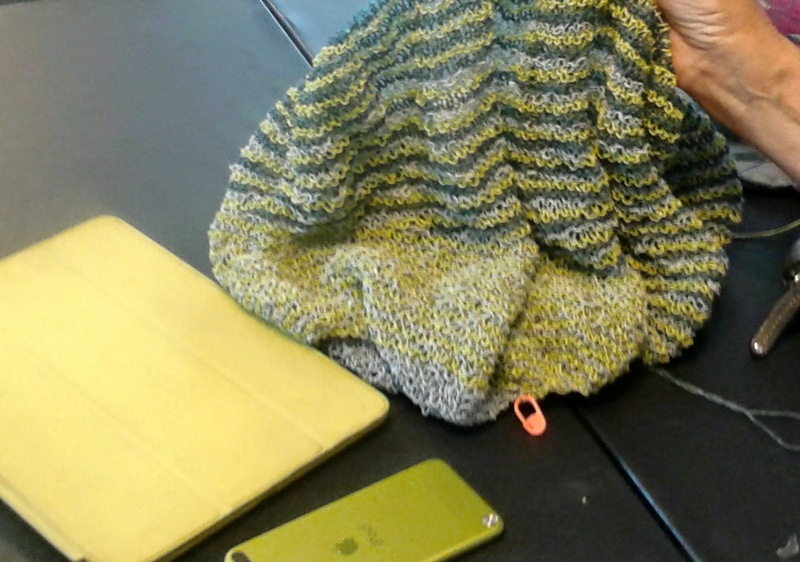 Her I Pad, her I Pod,and her knitting. Her 'I Knit' I said. Shawls were 'the project' today. 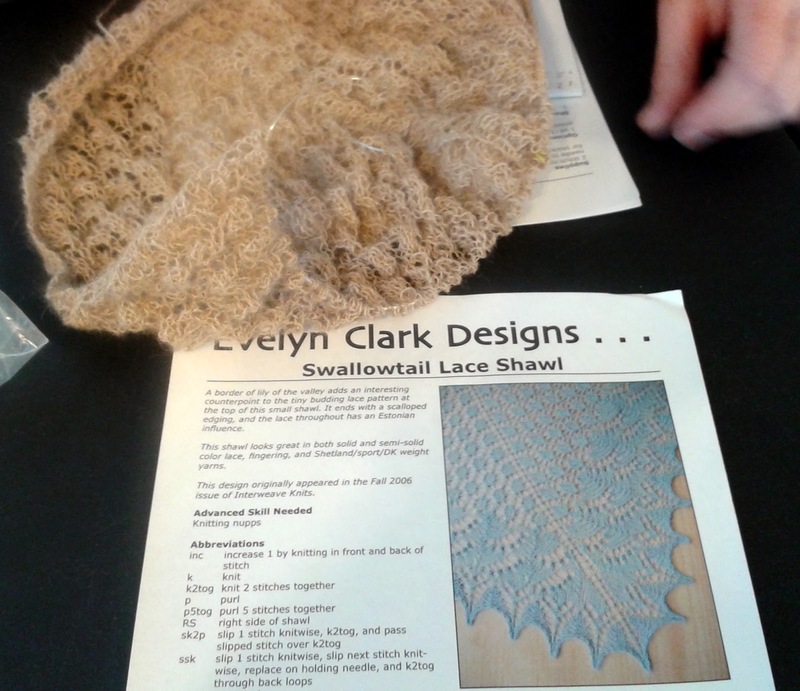 Jean has Swallowtail started with very, very fine Alpaca. 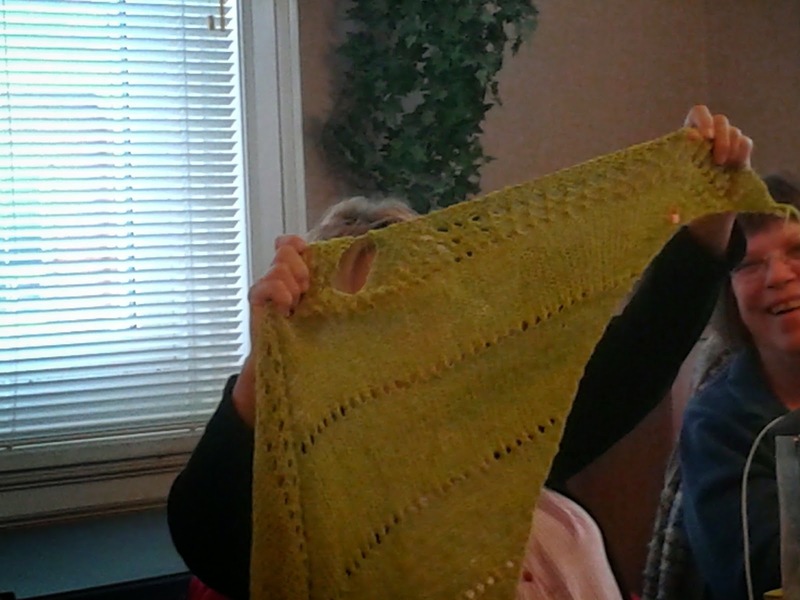 and Nan has almost finished a shawl of her own design. Nan's is knit with Tanis Fibre Arts DK weight and although my camera didn't capture it, the colour is a lovely tonal brown. Both the Fine Alpaca and the DK wool should be very cozy and warm for next winter. Or next week if things don't warm up. There are many, many things one cannot do on a cold spring day: Too cold to garden, hike, head to the beach or eat ice cream outdoors. But never too cold to knit. Just a bit of car knitting was all that happened needle-wise this weekend. Fred and I took off for the big smoke. 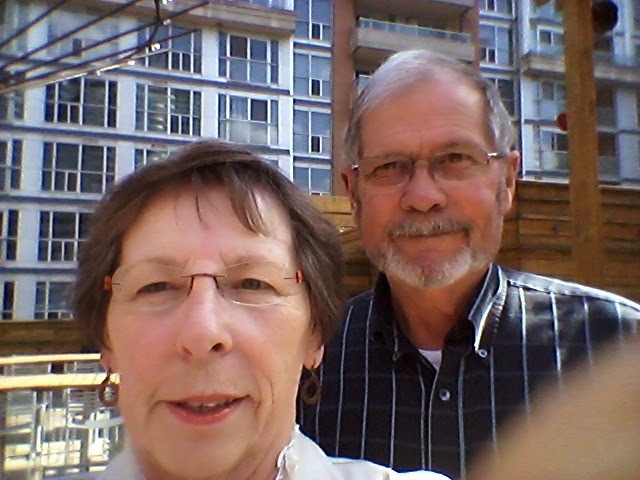 We had some mega-city errands to run (shopping at Ikea) and wanted to visit with Peter and his Lady Of Spain whom we hadn't seen since the time between our Florida and Hawaii vacations. 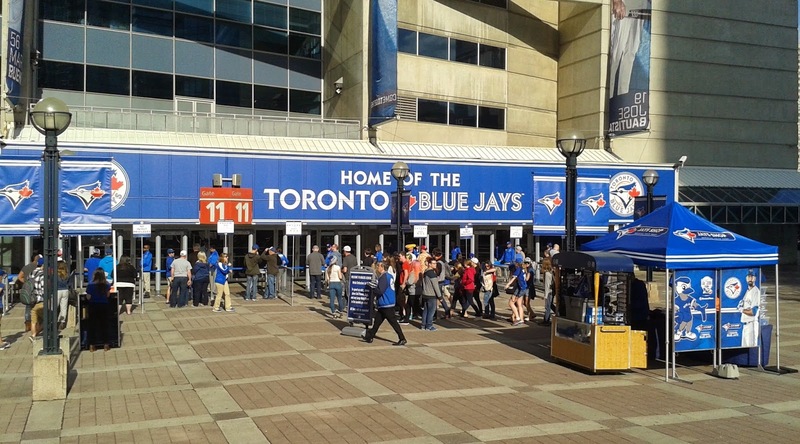 The idea started when I tried to get tickets to the Blue Jays home opener. But those tickets sold out faster than I can think. We chose the Friday night game instead. I had some air miles to spare so we treated ourselves to a room at the Sheraton across from city hall. 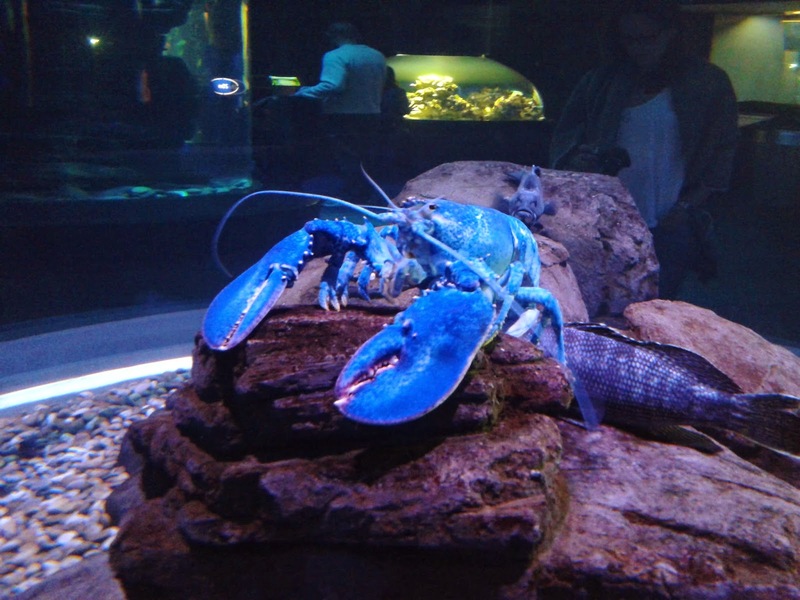 Saturday, we caught the last day of Peter's latest art show at the Godard Gallery, went to lunch with Danny Marks at The Rex, ate dinner at an outdoor patio and had our first trip to the now, almost-new Ripley's Aquarium. Whew! How much can be packed into a two day weekend? The roof top patio at Wayne Gretzky's bar before the game. 46 steps to climb to get there. We didn't see one overweight person up there. I need a selfie stick! 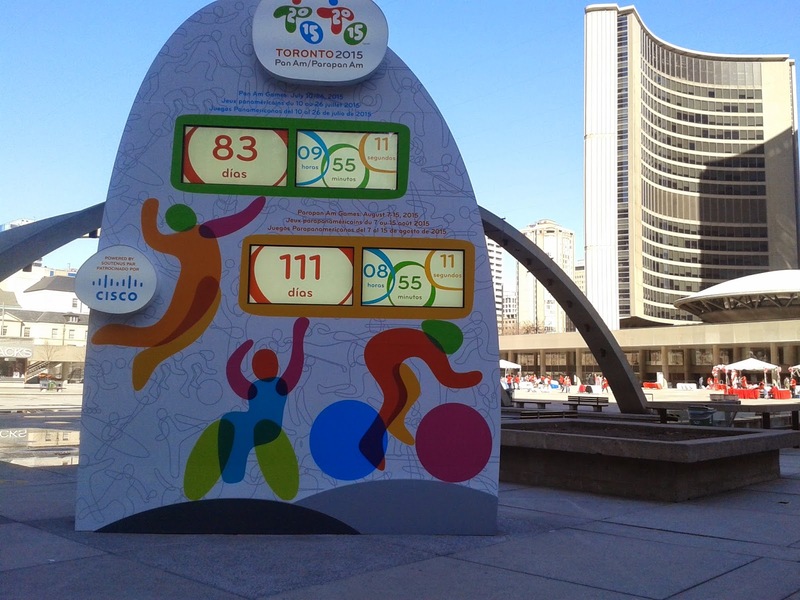 The Pan Am Games count-down sign at city hall. 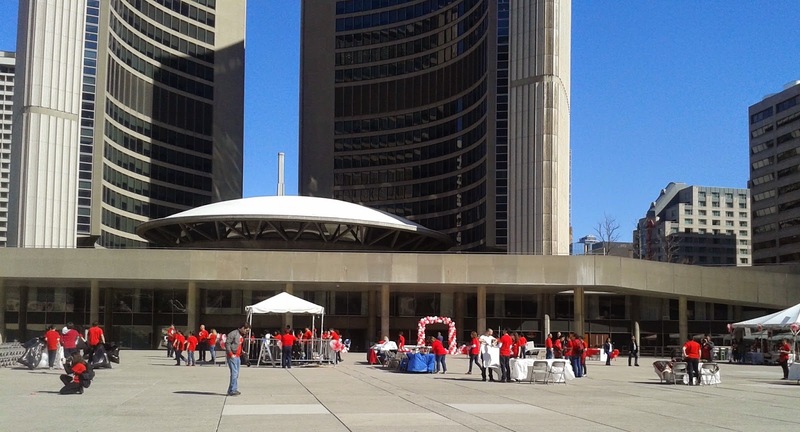 Volunteers in red shirts setting up displays in front of city hall for an International Children's Day celebration. Who says big cities are not warm hearted? 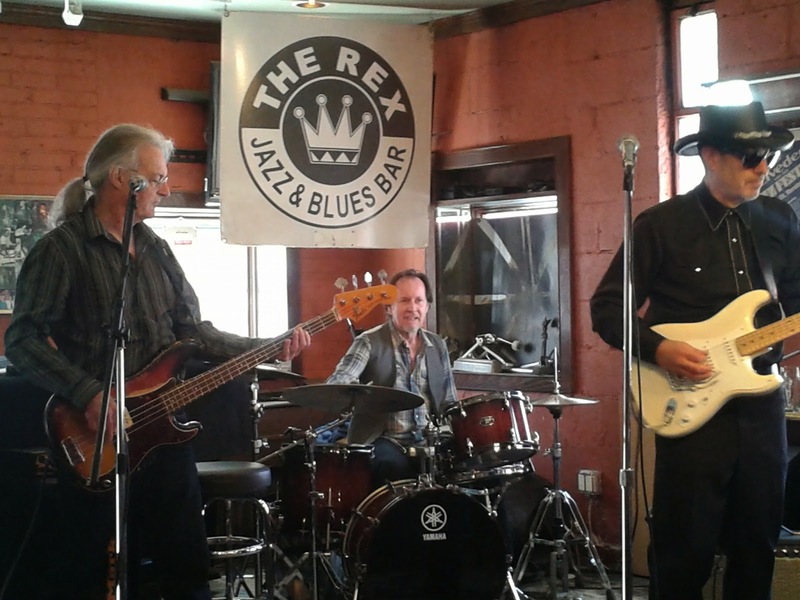 Danny - wearing the hat - and friends at The Rex. Noon to 3 every Saturday. The regular drummer was on vacation and the substitute had played with Anne Murray for 24 years! 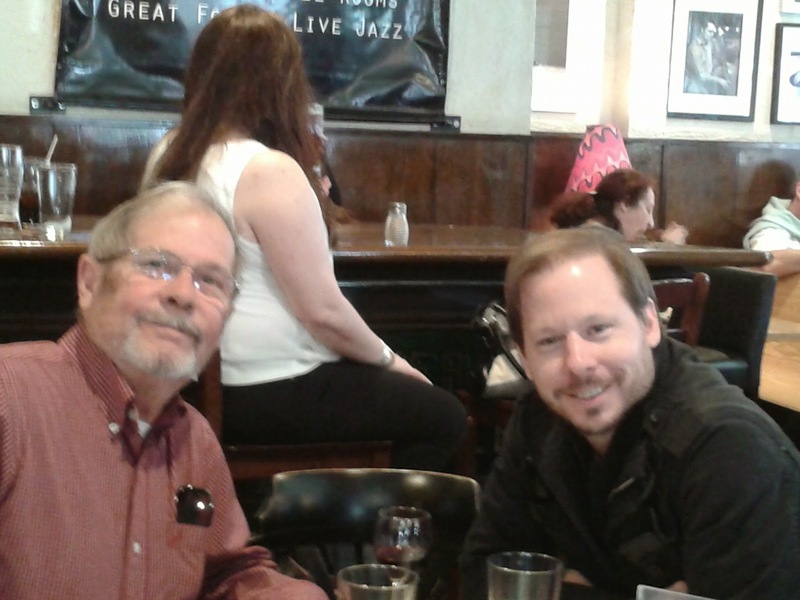 Two of my favourite men. 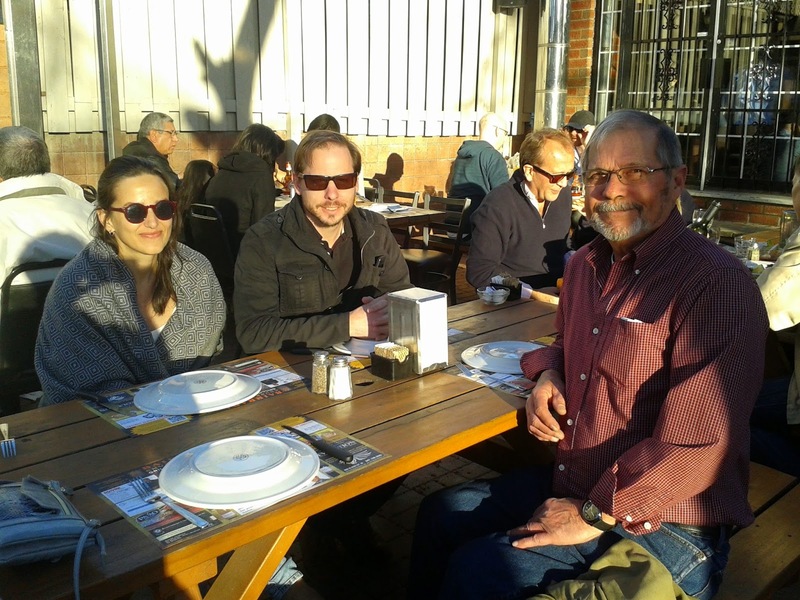 As cool as it was by the time the sun went down, you couldn't stop these Canadians and one Spanish transplant from eating outdoors on the first warm day this year. 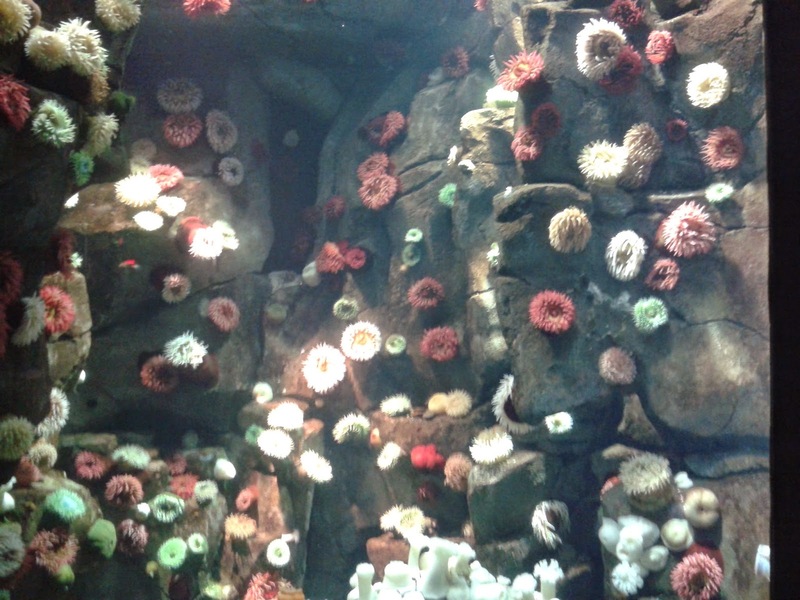 A couple of shots from the Aquarium. Some marvellous Toronto Architecture and lots of big city fun. A great weekend. Now back to our normal programming. 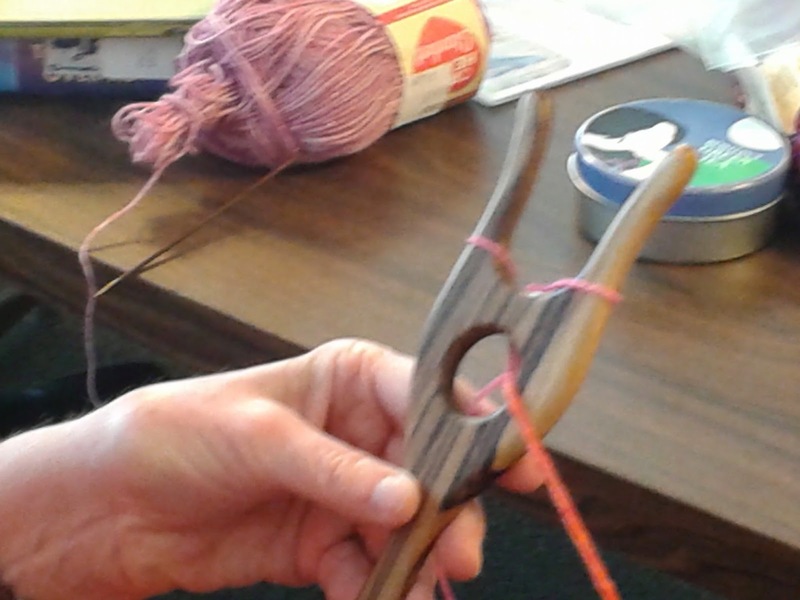 Warm temperatures, sunny skies and gorgeous work shown at knit group today. 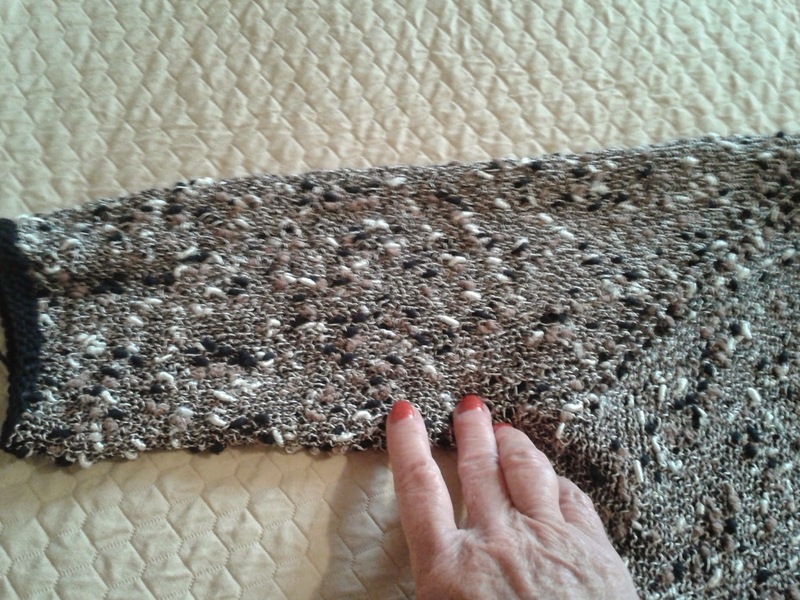 Carol has a lace-weight, silk top close to completion. 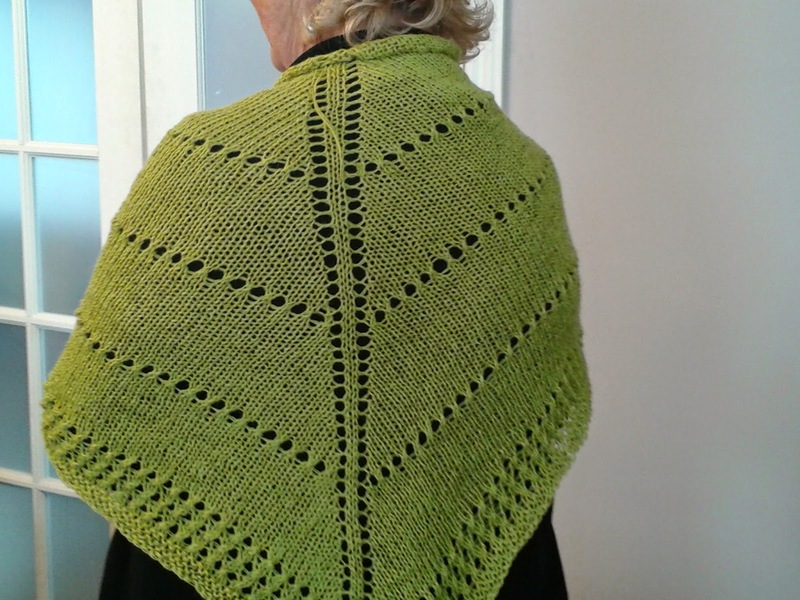 Wide and drapey, in such a gorgeous colour - you have a winner on your hands, Carol. Gail and I have similar taste it would appear. 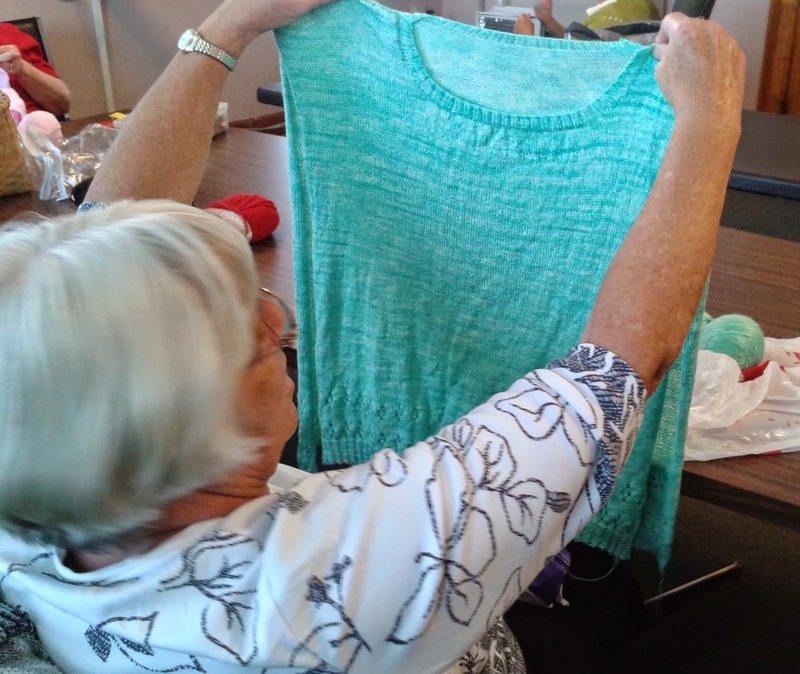 She showed us the sweater she is working on. A purple beauty. and yarn for this beauty. Recently, I was in Riverside Yarns myself and purchased the same pattern. 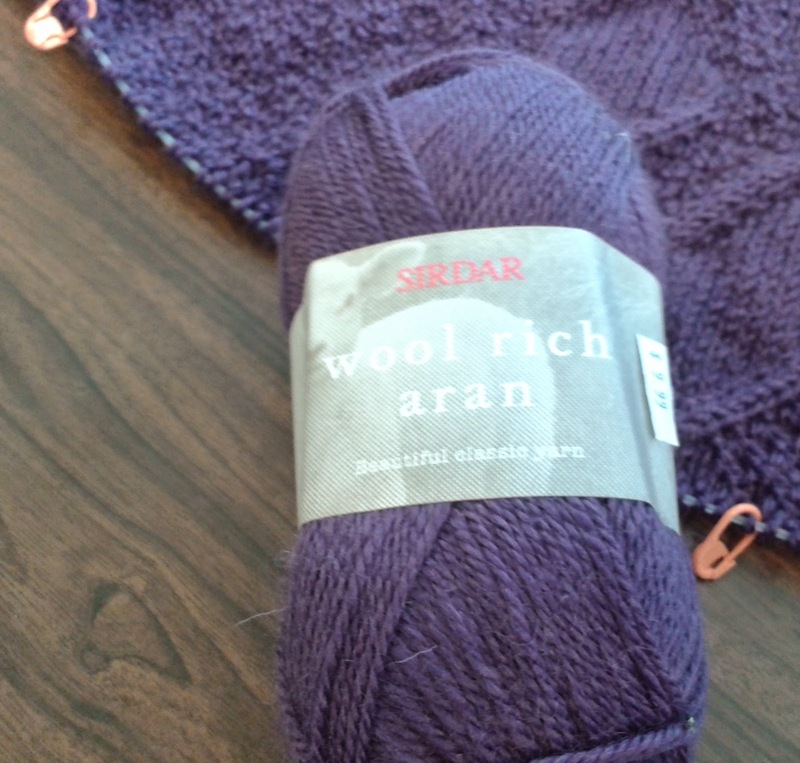 The yarn is a wool/acrylic blend. The addition of the acrylic makes it very light-weight. I'll copy you on this one, Gail. We mocked Sharon R. today. Aren't we cruel? Gail noticed it first. Then Nan tried to show her a different way but ended up saying - "Hey, if it works for you, go for it." 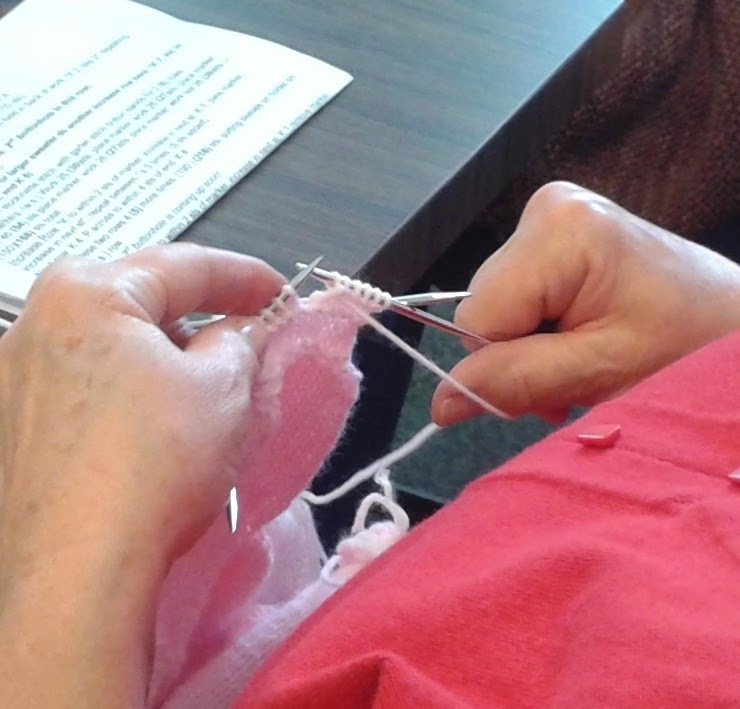 I am speaking of the way Sharon holds her right hand to purl when working with 4 double pointed needles. See how far back on the needle she has her grip. More like holding a wooden spoon to stir the pot. But since she is almost finished this great piece, I guess it doesn't slow her down. 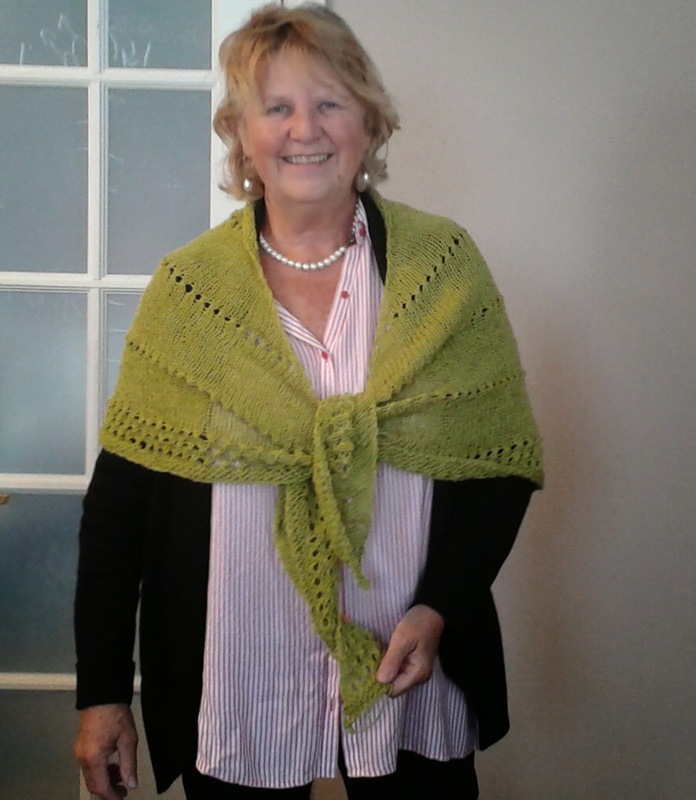 Sandy looked like spring itself in a light green blouse with her latest green shawl. 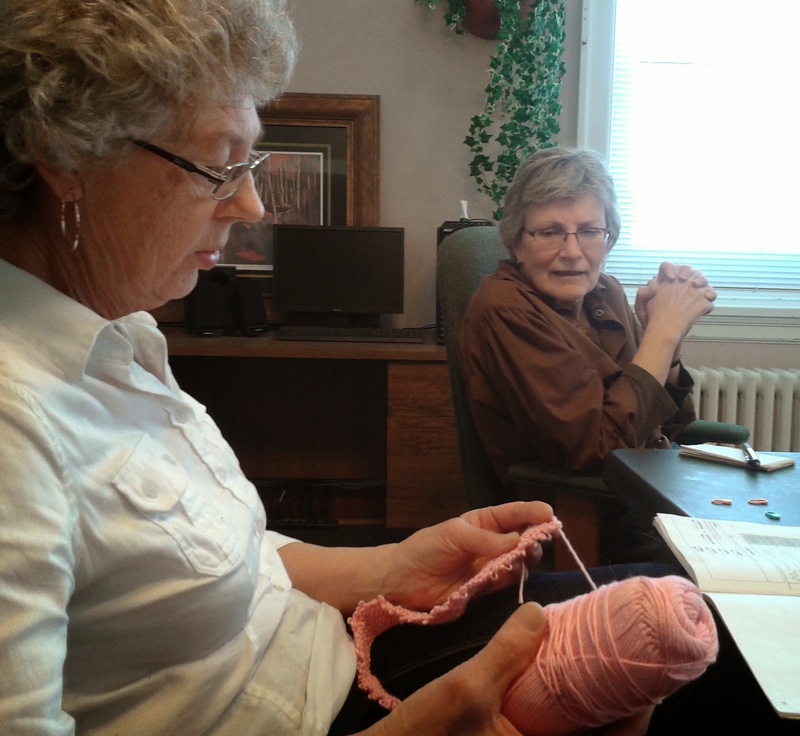 Here she shows us her latest, newest needle holders. Not some little tip cover that can slip off leaving a devastating loss of stitches, but rather these l o n g tube-like holders. Wilma was working on a top-down sweater all afternoon. Then she wasn't. Ripping it out, she said "I made a mistake" A non-fixable mistake obviously. Such a shame. Unless you think of it as an opportunity to do more knitting. Some silk. Some wool. Some cotton. Some Linen. Must be the in-between season. Our yarn selection might change with the seasons, but our hands are always knitting. 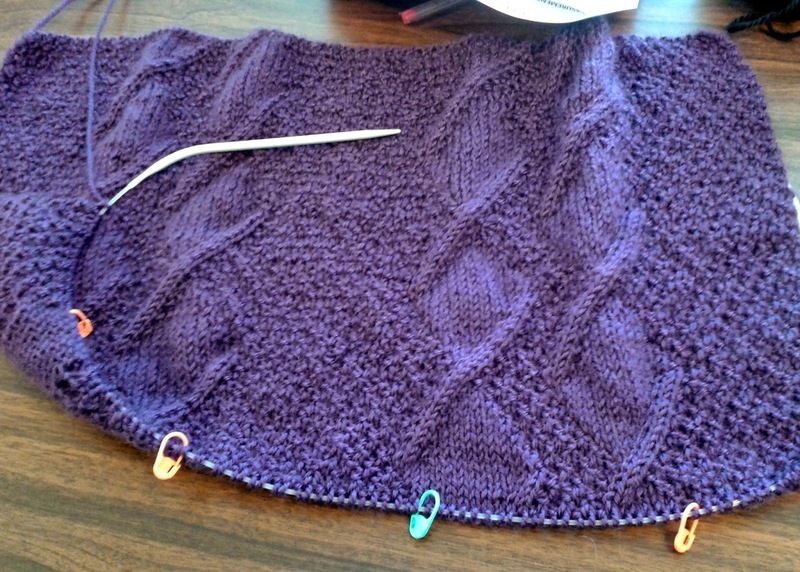 In between - and after - lengethening the sleeves on Fauxnel, I have been knitting away on the Sheer Panel Top. 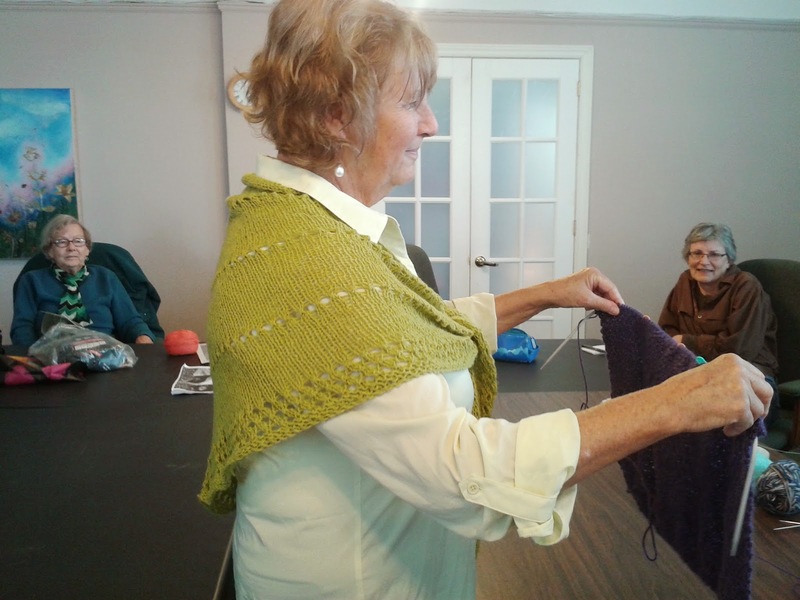 Like so much of knitting, it is a relaxing, calming knit of stockinet. With just enough 'chart' to follow to keep me awake. and it won't be much longer before I cast off the shoulders. Then on to the front. The way our weather has gone from deep, ice-cold, bitter-wind winter to 'Whew! 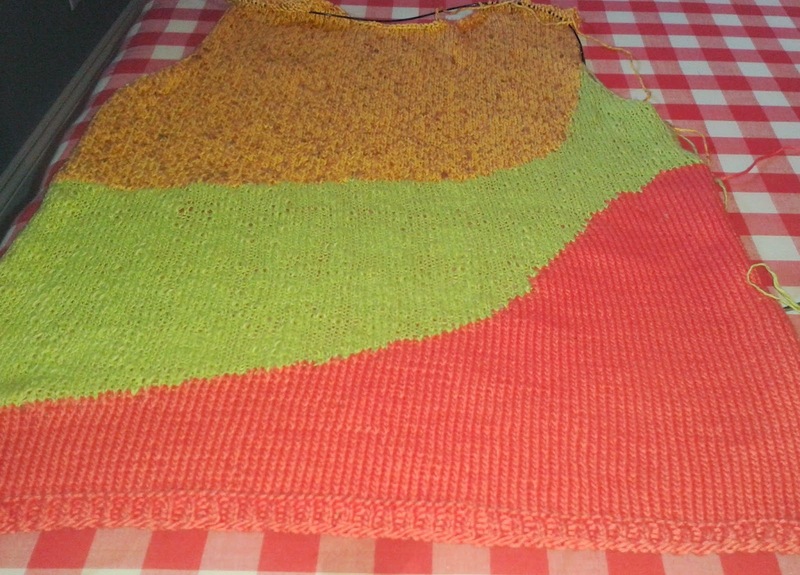 It's hot', I can't finish this top soon enough. PS. IF you missed Sel & Poivre's post yesterday. Head on over there to see what her 'Beloved' was up to. Still - LOL here. 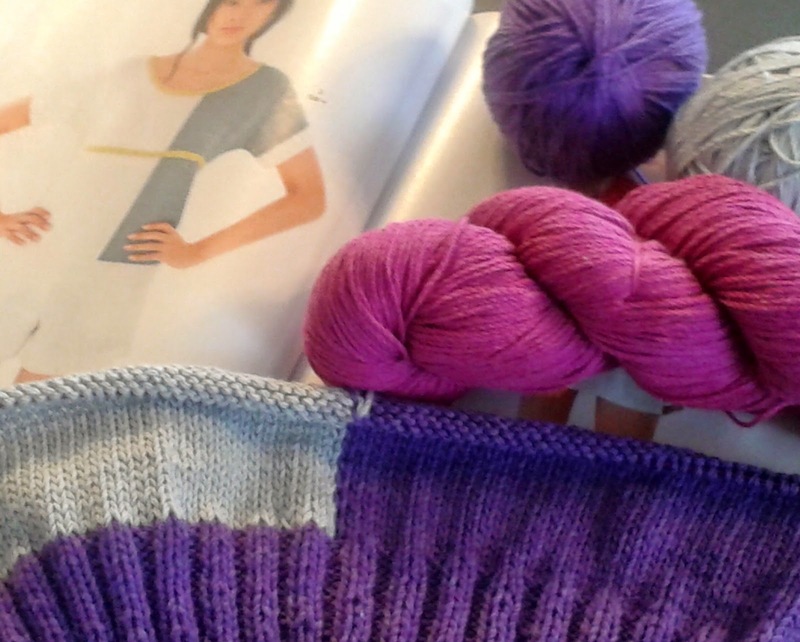 Trying for an insta-sweater for spring, I interrupted my normal programming to lengthen the sleeves on Fauxnel. Just a few wearings last fall convinced me that Fauxnel's short sleeves were at odds with the heavy fabric of the sweater. 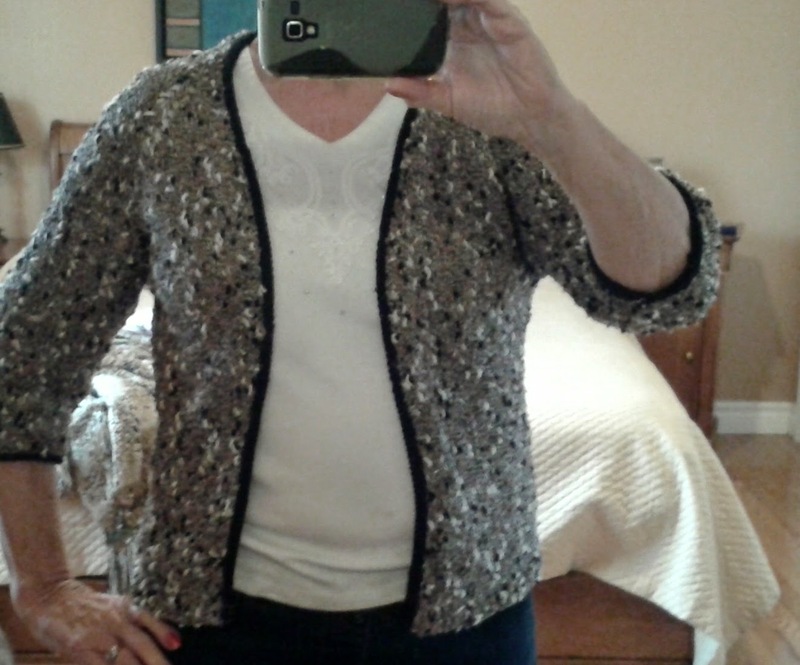 The fabric made it too warm a sweater for summer wear. The short sleeves made it too cold a wear for spring or fall. Lengthening the sleeves was the obvious answer. Luckily, I had knit Fauxnel top-down so it was an easy job to undo the cast off, thread the needle thru the stitches (thank goodness for ravelry as I had forgotten the needle size) and keep on knittin'. Finished, worn and complimented last week, I now have a much more usable garment. 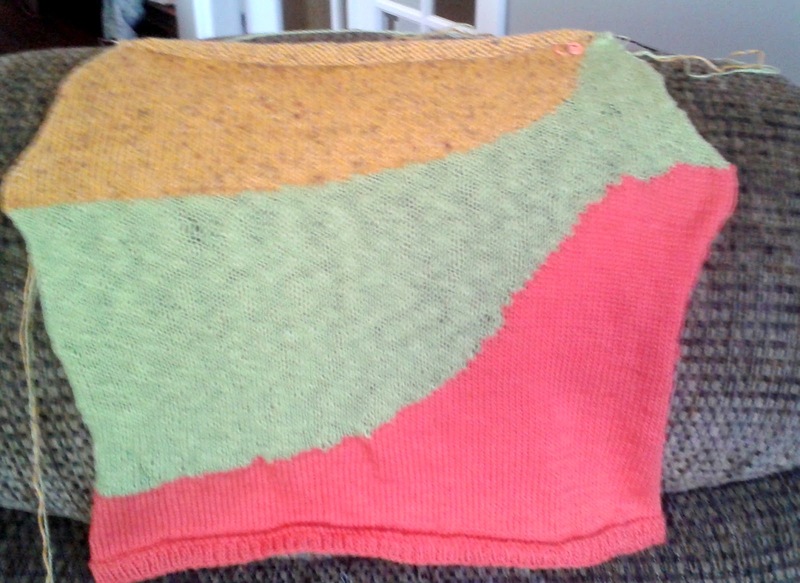 In progress, one sleeve lengthened, one on the needles. My fingers are placed about where the shorter sleeve ended, showing the amount of extra I added. 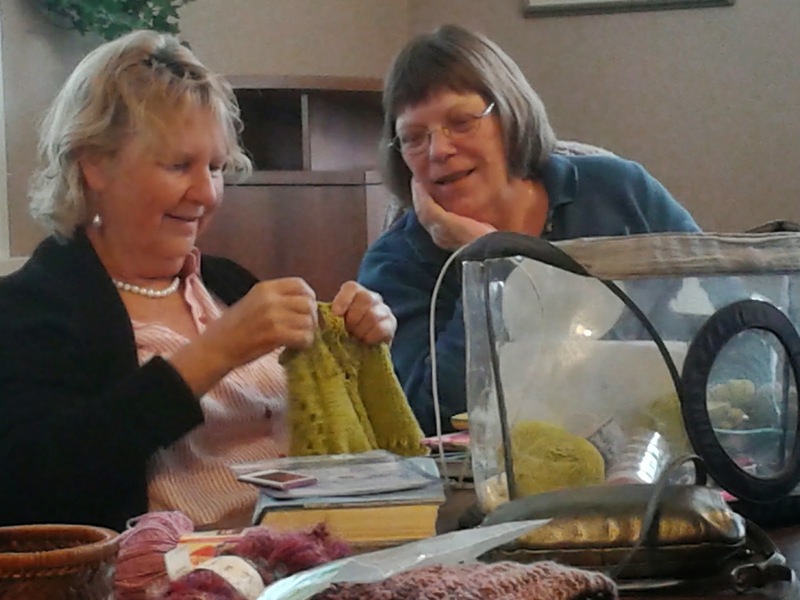 Between returned snowbirds and visitors there was a great crowd at knit group today. 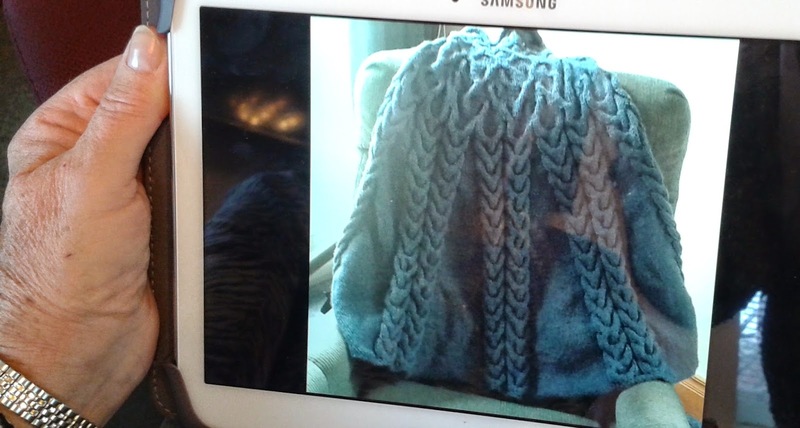 Carol, mastering her new tablet, took some great pictures of her winter knitting. I took pictures of her pictures. How far photography has come. 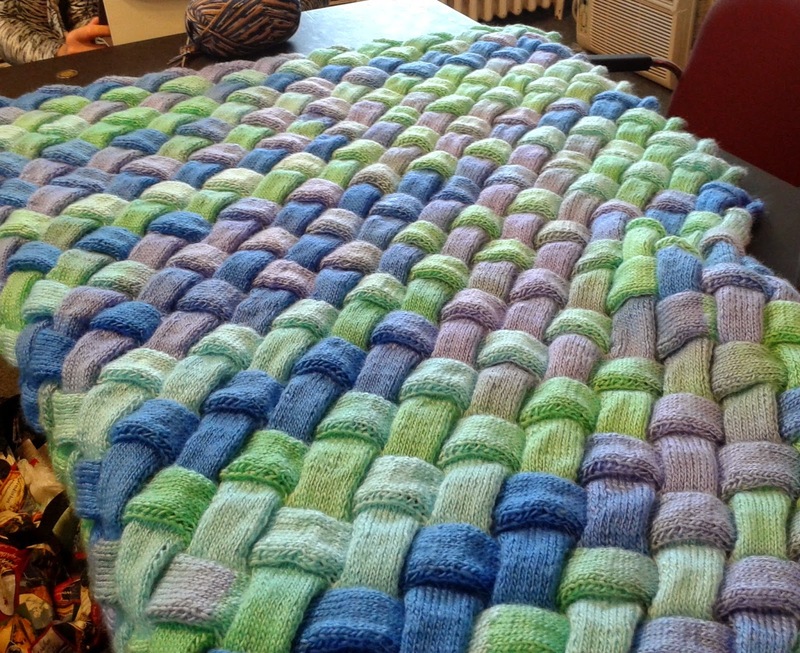 This is an entrelac afghan. The most entrelac I have ever challenged myself to do is a scarf. Something this big I would never tackle. But it is lovely, Carol. 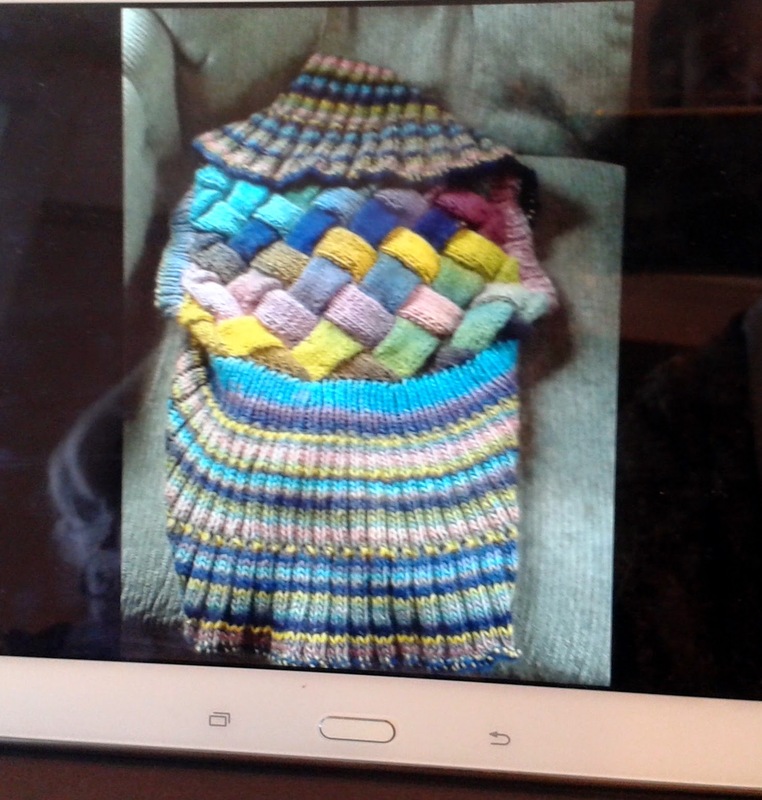 Still on the entrelac path, she showed me a picture of a shrug she made. 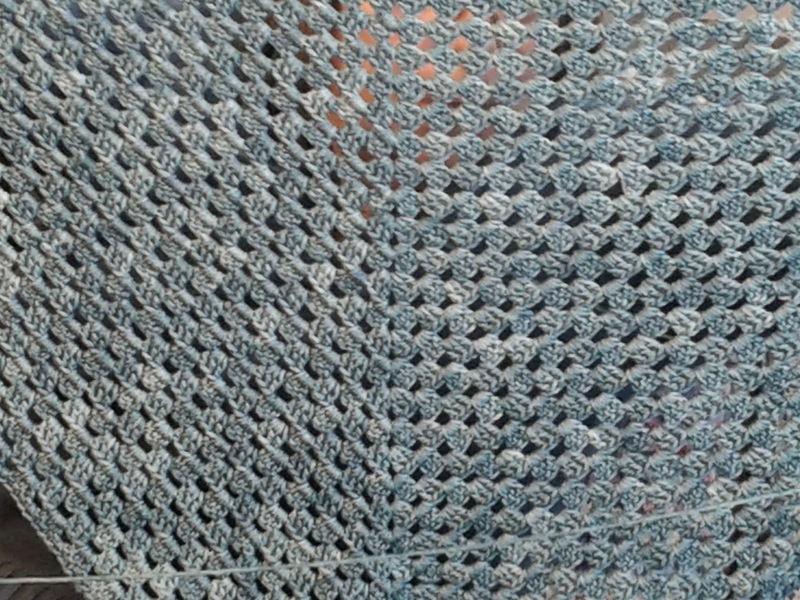 Beginning with Entrelac in the centre back, you then pick up stitches and work ribbing round and round. A one of a kind piece. 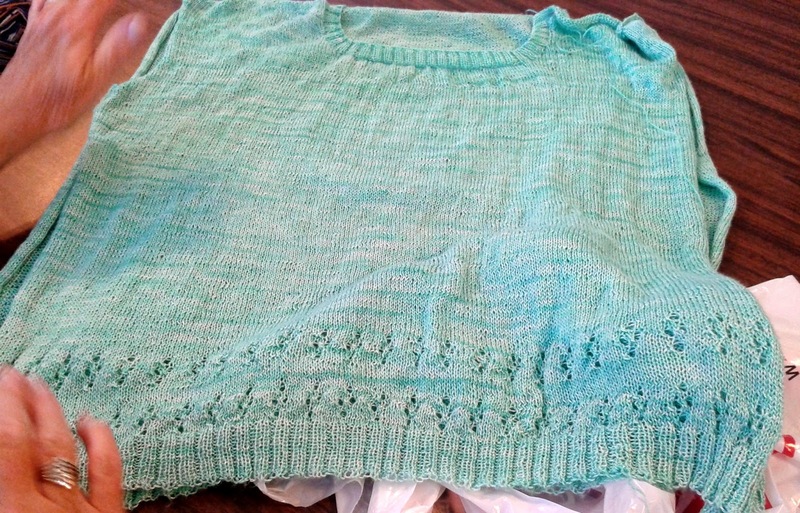 Then she showed me this lovely cabled poncho with sleeves. Quite a winter's work to show off, Carol. Sharon brought a new toy. It attracted much interest. Called a Lucette, it produces, what appears to be a type of double-wide corking. Used to fasten medieval clothing parts, said Sharon. Although the only reference I could find to Lucette online was that is was the name of Paul Bunyan's girlfriend. 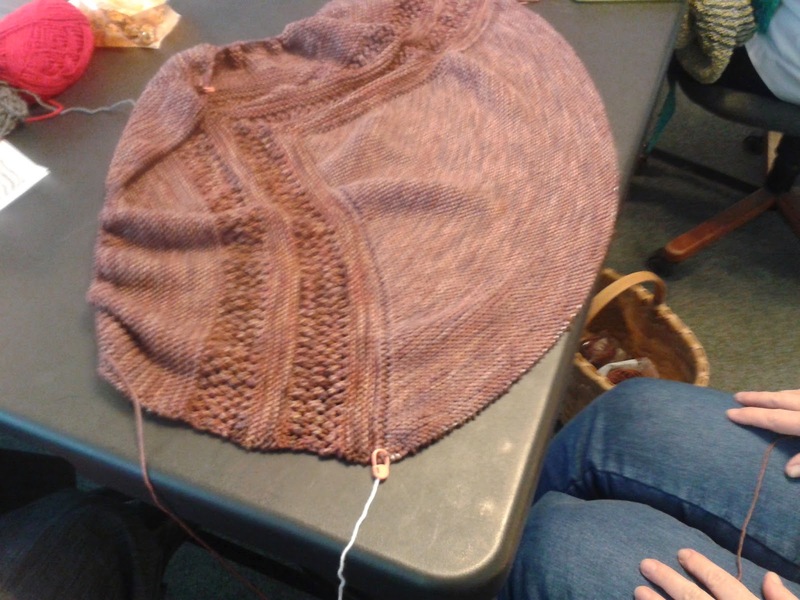 Sharon R has been working on her first Intarsia. 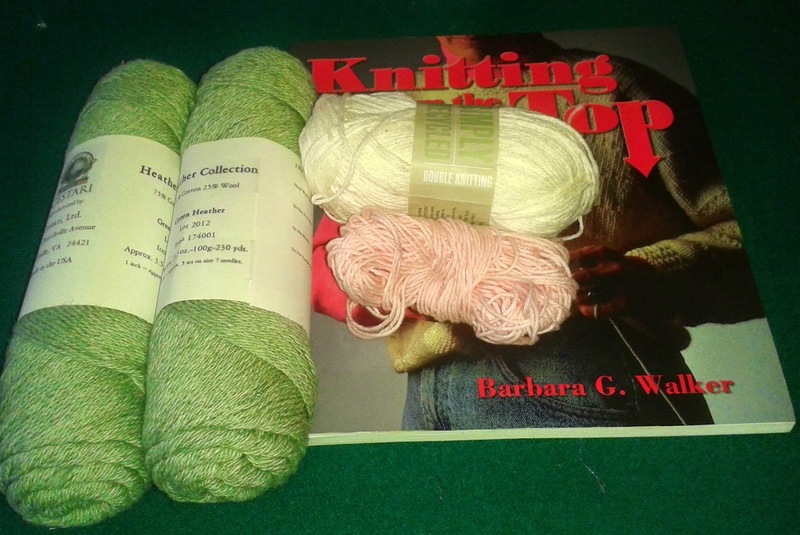 Sharon , a relatively new knitter is always looking for projects that will expand her knowledge base. And she doesn't shy away from a challenge. 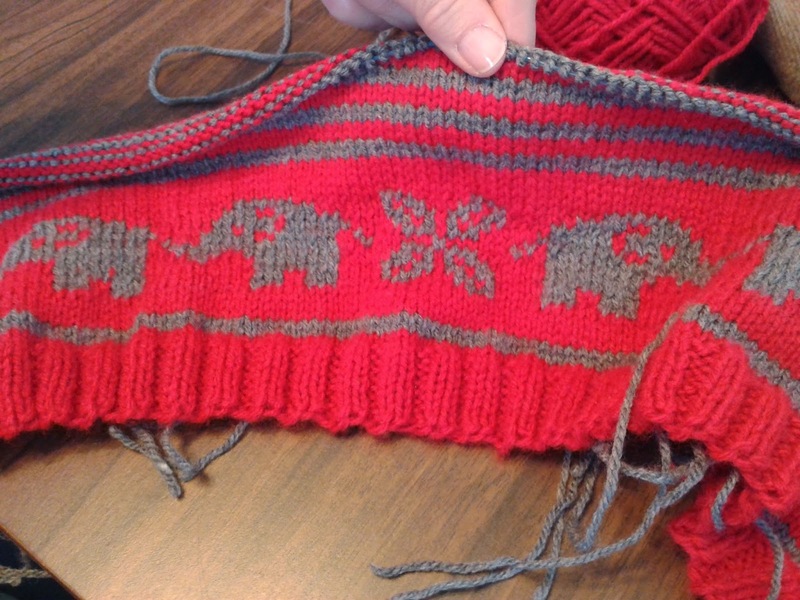 This is a child's sweater with Elephant Intarsia just above the bottom ribbing. A beautiful job you have done, Sharon. And your new socks are lovely too. 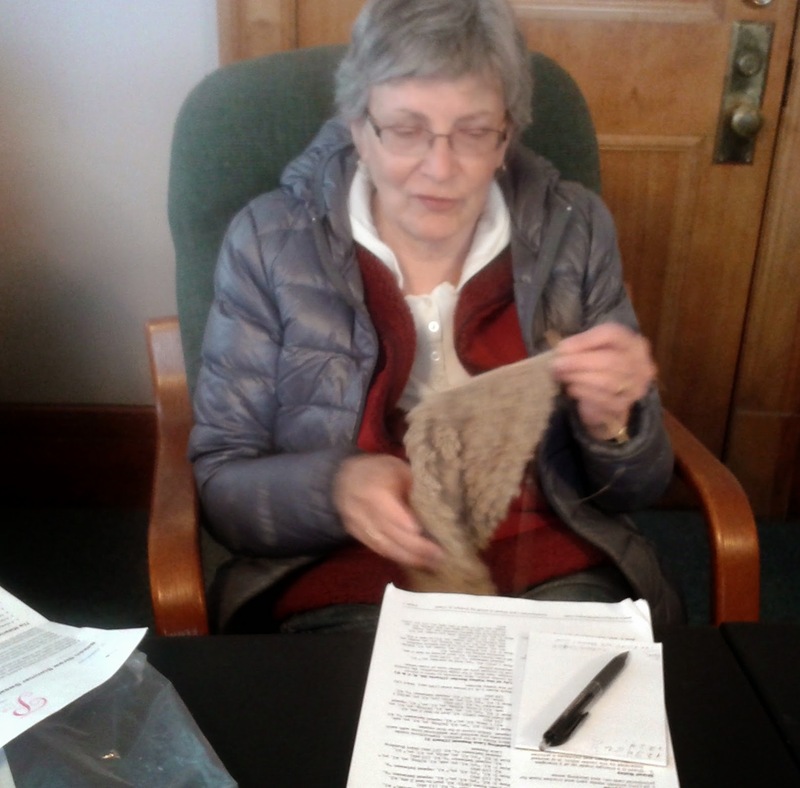 Sandy worked quickly throughout the afternoon to finish her latest linen shawl. A little too quickly it would seem as the cast off puzzled both her and Nan. Seems it wasn't quite right. As Sandy said, no matter how long you've been knitting, you can always find new ways to screw up. It took a re-do, but she finished before we left. Nan, clever fibre artist that she is, has recently taught herself to crochet. 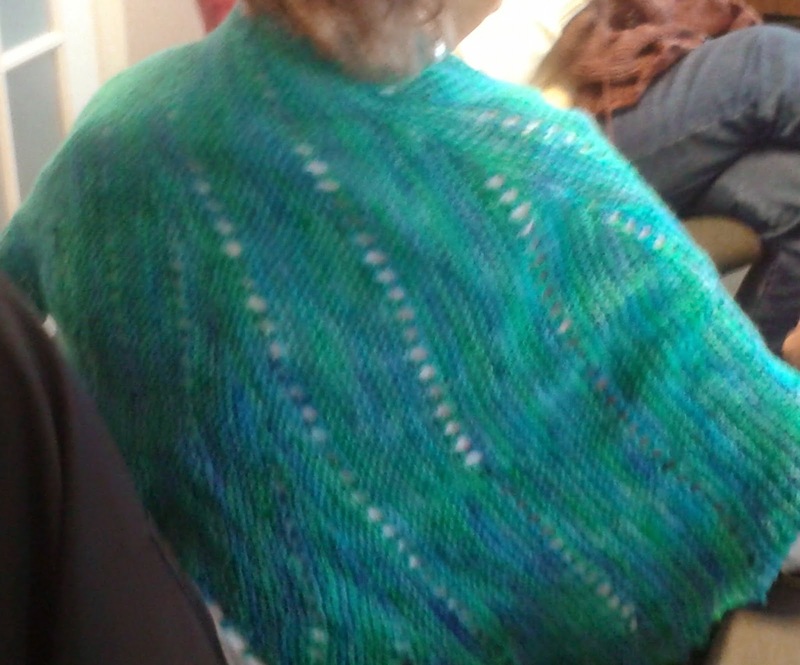 After only 4 hours she has a great shawl to show for her efforts. Lovely stitch, which Nan called the Granny Square Stitch. Is that the same as a double crochet? 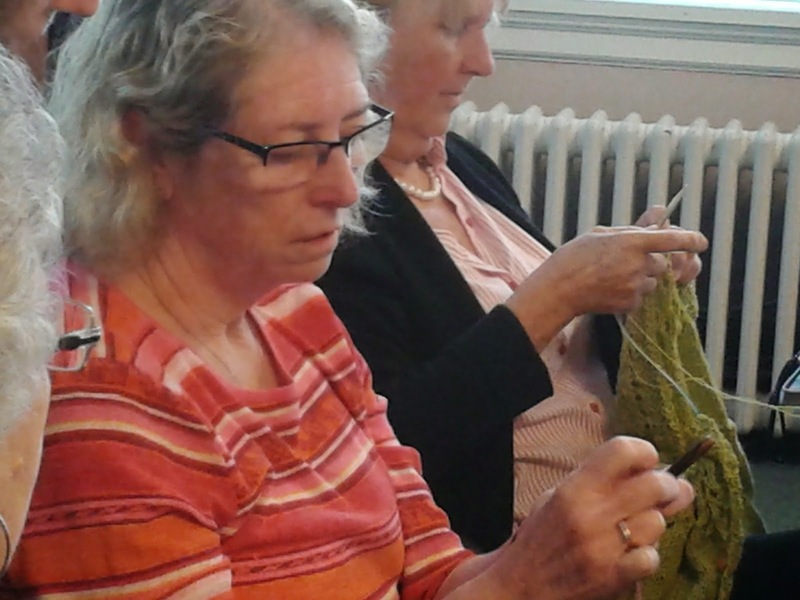 Another great day at knit group. Nice to see the snowbirds back. We like having them back more than they like being back. But knit group helps they tell us.